I am a die-hard fan of the Duggars. No denying it and they will always have a special place in my heart. However, I gotta say, I am pretty impressed with the Bates. Now, I know that like all things, a shiny new toy will take precedence over an old favorite. I remember seeing the Duggars for the first time and I was so mesmerized by them that they were all that I could think about for a while. Really, they changed my life and are almost solely responsible for our decision to Take Back Our Kids and Homeschool! (I have an entire post dedicated to the impact the Duggar family has had on my family’s life). So saying, the newness of the Bates is probably what is making them so fascinating to me. Of course, they are not so new, as any Duggar fan will tell you. They have been featured on the Duggars show for years, so we kinda got to know them a little bit there. There are many differences between the Duggars and Bates, but they are also very much a alike. So I decided to give a rundown of their contrasts and similarities, from my own personal knowledge…..which is more extensive than I care to admit being I have watched the Duggars show a zillion times from the first documentaries, to last night’s season premier! 1. They are both Fundamental Baptists. 2. They both belong to the Advanced Training Institute of Bill Gothard. This is an organization for Christian homeschoolers that provides curriculum, seminars, and homeschool events. The Duggars and the Bates met at the Big Sandy Homeschool Conference, which is put on by ATI. 3. They both have 19 kids! 4. Both Michelle Duggar and Kelly Bates have had to deal with the pain of miscarriage. 5. Both families have children whose names are the same. Josie and Jackson. 6. Both families have left the number of children that they have up to God. 7. Both families have an older child help out a younger child. The Duggars call it “The Buddy System” and the Bates say “Partners”. 9. Both families have musical children. The Duggars can play the piano, violin and guitar. The Bates can play the piano, fiddle, banjo (I think I remember seeing this, but I could be wrong), and guitar. 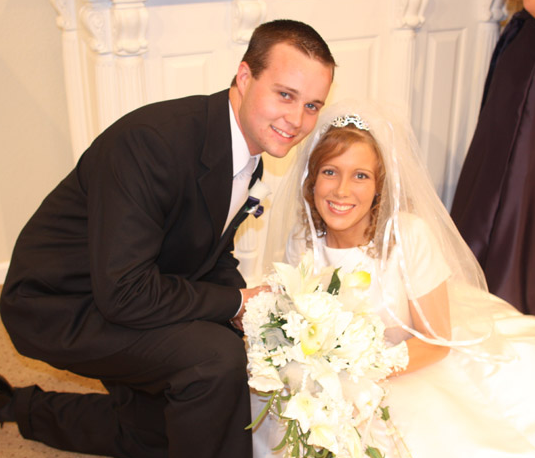 Josh and Anna Duggar on their wedding day. 10. Both sets of children believe in ‘Courting’ and not dating. Josh Duggar courted Anna Keller, and then went on to marry her and have two adorable kids. Now, there is much speculation about Josh having been ‘betrothed’ to a girl in the Holt family, which we met in the very first documentary about the Duggars. I am not sure about what went down there and I am not going to go digging around anymore about a teenage boy and his history of crushes, because when I did once, I got a whole lot of information about people and the anti-quivering movement. I had never even heard of this, so I cannot even begin to try and understand it. The Bates’ oldest son, Zach, entered into a courtship-relationship with Sarah Reith, but it did not work out. Sad really, because Zach asked Sarah to enter into a courtship on television, and now that it didn’t work out, it is probably embarrassing to him. Ah…the perils of reality television. 11. Both families work for themselves, and have their own businesses. They also teach their sons to open their own businesses. 12. Both Michelle and Kelly have a very sweet and calm disposition mothering style. 13. Both Jim Bob and Gil have a very hands-on and protective fathering style. 14. Both families older children have volunteered with their local fire departments and first responders departments. 1. The Duggars are very frugal, and it is a big part of their life. There are many episodes in which they try to teach their viewers how to save money. In fact, I have learned a great deal about being frugal from them! The Bates….not so much. Well, I guess I cannot say that they are not frugal, it’s just that they are not as frugal as the Duggars……or so it would seem from the few episodes that have aired so far. Lawson (one of the older boys) does all of the grocery shopping and he tries to save money. Yet, he was shopping in a regular grocery store, instead of a bulk store which could save them much money. Kelly recently said in one of the episodes how she and the girls are terrible at shopping, because they never look at prices, they just buy what they need. Wow….I cannot even imagine! 2. The Duggars use computers to homeschool English and Math (Switched on Schoolhouse), with Jessa overseeing her siblings work, third grade and up. Michelle teaches the Wisdom Books (part of the ATI curriculum) for Bible and Science to all the kids, and teaches phonics and math skills to Kindergarten, First and Second graders. Kelly Bates has it going on! She finds the time to give all of the children her attention when it comes to school! Now, I only got to see one episode where you see the kids homeschooling, but she was all over the place with every single child. The only curriculum I recognized was Abeka readers and in the previous documentary I noticed the Character Sketches 3 volume set on a shelf. 3. The Duggars own rental properties which provides income. They were self made before the show ever started, and they were in the process of building their dinosaur of a house before the cameras ever started rolling. 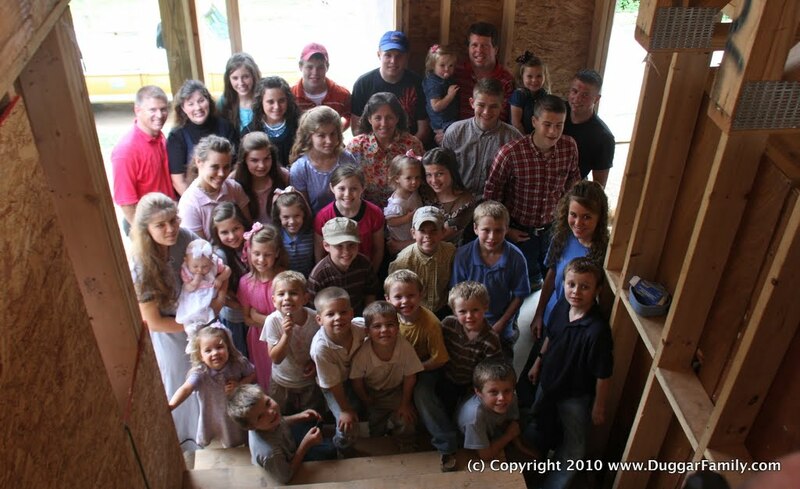 TLC did help them finish the house for one of their documentaries, but the Duggars would have done it on their own…..for that you can be sure. Point here is that the Duggars did not need the money from their show. The Bates own a tree service which provides income. However, unlike the Duggars, they were content to live in a very tiny house with all of those people and only 2 bathrooms. They may not have been able to afford more, however, I do not know anything about their finances, so I can’t be sure (and it’s none of my business!). The Duggars came in and donated labor and supplies to build the Bates this HUGE addition to their house, which is the house that you see in United States of America. There is one major thing that you can say about the Duggars…..they are VERY generous. 4. The older Duggar girls are very subdued and lady-like. Jana and Jill are the ‘mothers and homemakers’ of the bunch. Jessa is the school teacher, and Jinger is the photographer. All of the girls help with the packing, laundry, shopping and younger children. They are a true inspiration. The older Bates girls, Michaella (a sweet motherly-type), Erin (a beautiful pianist) and Alyssa (a very graceful girl who is also the photographer of the family), are just as mature and sweet as the Duggar girls. However, the middle Bates girls are a bit different. I had noticed before that some of them speak their minds a lot….and that is not necessarily a bad thing. My daughter actually likes that fact a lot, because she can relate to the Bates girls more because of it. However, sometimes they will go on about not liking something, not liking something about a person, or they will tell some of the family’s dirty laundry. All of which is normal, but it would not be something that I would want my daughter to do. These are teaching moments, and unfortunately, their moments happen on television. 5. The Duggars travel…….A LOT! As a matter of fact, and I know this will come as a shock, but I am losing interest in my favorite show because of it 😦 In the beginning, it was all about their faith, their values, the logistics of having such a large family, going on mission trips, school field trips, etc. Now, it is all about their engagements and what new activity they can participate in. All of that is great, but it is not what drew all of their fans. It was their faith, sweet spirits, their simple ways, and their character-driven child rearing that pulled me to them……and made me want to change my ways and family. I still love them……I just get this sad little feeling that television is changing them. Which brings me to the Bates. They are at the beginning and are just like the Duggars used to be. They are all about their faith and their family…..and their simple way of like. I just know that they will change too, they will get super famous, and they will no longer be able to carry on a simple life. Makes me sad. 6. The Duggars host a ‘Home Church’ at their home each Sunday. They have since the first documentary. When Josie was in the hospital, they went to a regular Baptist church, and I think they attend different churches when they travel. However, for the most part, they host church at home. The Bates attend a small Baptist church in their home state of Tennessee. 7. The Duggars can all travel together…..the whole family including Josh’s small family and Grandma, in their family’s RV. The Bates received another generous gift from the Duggars…..a very large van which will hold most of them. They only need to have a few of the older children follow behind them now. 8. 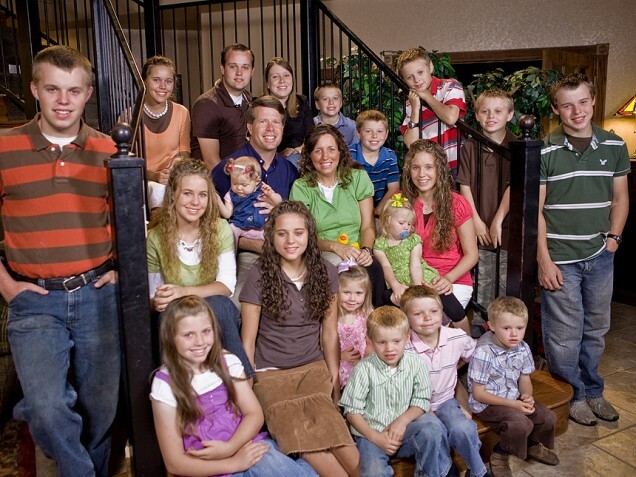 The Duggars live in the country, but…..
9. The Duggars are lovers. They love their children and it shows. However, kisses are very quick, and for the kids are on the top of their heads. Hugs are given from the side. All great, but you can tell that this is the only way they are comfortable, which works for them. The Bates are more like my family. Big sloppy kisses….and lots of them! Hugs are plentiful too! 10. The Duggars have family members that have come onto the show and expressed previous concerns about them having so many children. Grandpa Duggar even said at one time, while he was still alive, that he didn’t think that they should have anymore. All pretty normal responses from family members about having so many children. We get it. The Bates, however, have not been so lucky. Yes, there are a few family members that were just as respectful as the Duggars family about having so many. And then there was Mama Jane (which is actually the Bates kids grandmother, and Gil’s mother). If you do not know how she behaved on the episode ‘Papa Bill’s Farm’, check out my post about it. I was so embarrassed and saddened FOR the Bates! They are always welcome at my house! Well, that’s all I have! I love BOTH of these families and think they are doing an amazing job raising all of their blessings. I just hope that reality television does not take it’s usual toll on them. ← How Beautiful is our God?